One way of learning more about a culture or country is to taste the authentic delicacies and traditional dishes enjoyed by the people. I love food and I wanted to learn more about Haitian food so I went on a search, I hope you enjoy what I have found, I even have a recipe for you to try to prepare one of the many delicious Haitian foods. No matter the city's recipe, though, rice remains a big part of the country's diet. 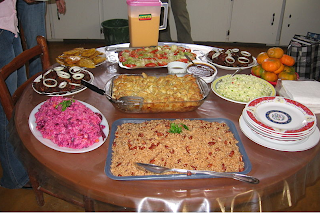 Haitians reserve some rice dishes, like "Diri ak djondjon" - black rice - for special occasions such as weddings or christenings. I just had it for the first time today. The mini shrimps that were mixed in made this dish divine. 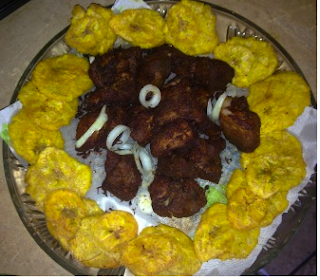 Another very popular haitian dish is griot - fried cubed pork. I included the recipe for you to enjoy. 1. Take the sour oranges, cut them in half. Squeeze them and put the juice in one cup. Don't throw away the squeezed halves, since you'll need them soon. 2. Place the pork, cut in cubes, in one bowl. Add salt to the meat. 3. Now, use the squeezed pulp to rub the meat, so you get it soaked in a salty, zesty orange mixture. In some recipes, they'll tell you to let it marinate overnight; but all Haitian grandmas will tell you that if you want your Griot right away, you got to take the proper measures for that. 5. Put the washed-pork meat, the orange juice (Yes, remember you squeezed it in a cup, right? ), the salt and all the remaining ingredients from the list in a pan. Leave the Jamaican pepper uncut since you don't want it to be too spicy. 7. Dab the boiled pork meat with a knife, if it pulls out easily, it's a sign that the meat is ready. 9. Now, get ready to start the griot process! Place the pork chunks in some heated oil and simmer for half an hour over low, covered heat. 10. Then, uncover and turn up the heat until the chunks dry up and show a golden color.